Since we were in the area after having spent Sunday afternoon with Andrew’s parents, I called in at my uncle and aunt’s place, who live in Dedham with their two girls. I must say, it is an absolutely beautiful part of the country and a great place to raise a family. I stayed with them for a couple of days while everybody else headed back to Cambridge. The evening I arrived we had a BBQ dinner (though I couldn’t eat very much after the amazing lunch we had been served at Andrew’s parents place), toasted marshmallows on the remains of the coals, then Mark and I headed down to the local pub for a pint and a catch up. We walked back to his house via the Essex Way, which is a public footpath / trail through both public and private property. One minute you’ll be walking through a farming area, the next around the side of a privately owned home. Although chilly walking through the fields, it was really lovely, and I must have seen a hundred rabbits bounding around. It was at this point I knew I had to bring Amanda back here so we could do this walk, but even better was still to come the next day. View from Flatford looking back towards Dedham. You can see Dedham church in the distance. 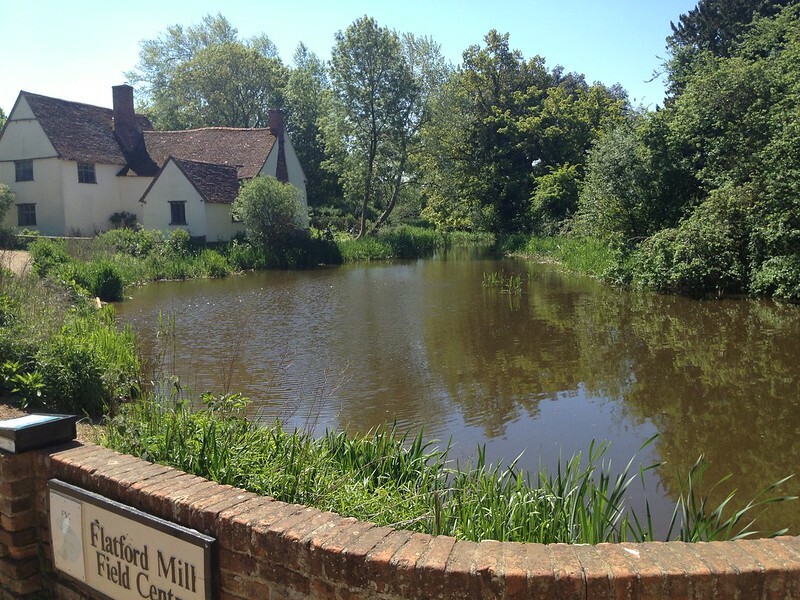 There are several famous paintings by John Constable which are of the Dedham and Flatford area. My grandmother owns a print of one of these called The Haywain, and when I learned that Mark now lives in the area where it was painted, I decided I’d like to go and see the spot which inspired the art – to walk around in a painting, basically. Around to the left is where Constable would have stood to paint The Haywain. 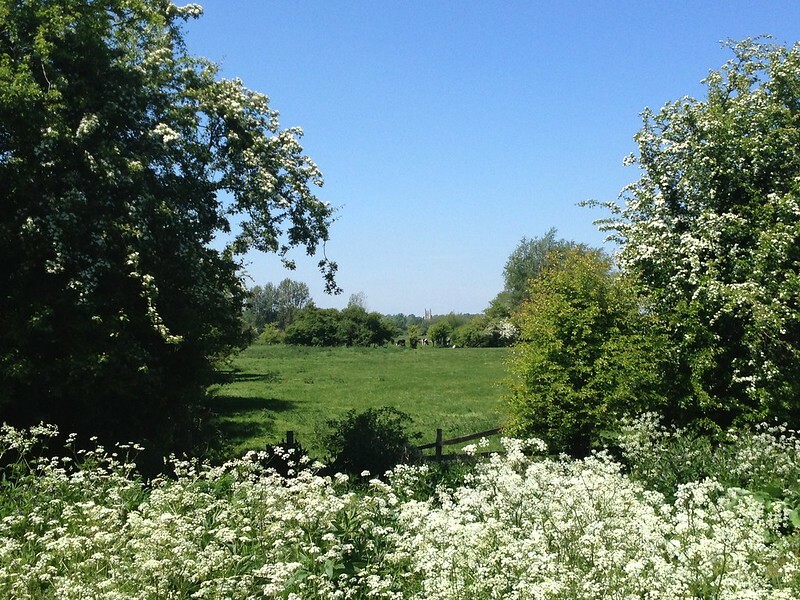 The area in which Constable painted, called the Dedham Vale, is now officially recognised as an Area of Outstanding Natural Beauty, and as such is protected from ‘unsympathetic development’ to preserve the natural landscape. Looking back towards Dedham over the River Stour. We were fortunate enough to have brilliant weather – the best I’ve experienced in England so far. We walked through wide green fields along the River Stour, trying not to scare the cows while we watched people navigating their hired boats down the river. We crossed the river and headed for Flatford, but not before stopping for a quick game of Pooh Sticks (came in second-last). Being as it was a bank holiday and fantastic weather, the area was full of families and couples out enjoying the sunshine and scenery. 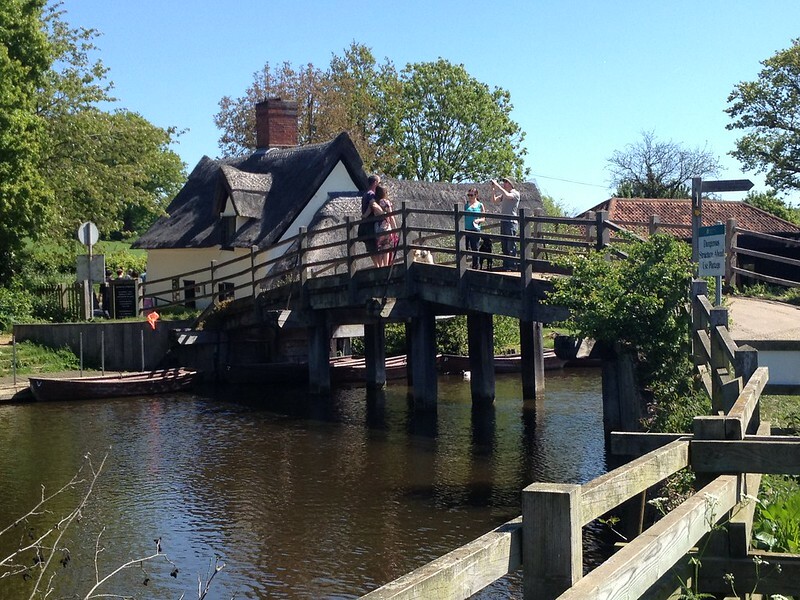 The bridge to Flatford Mill, behind which lies the Haywain. 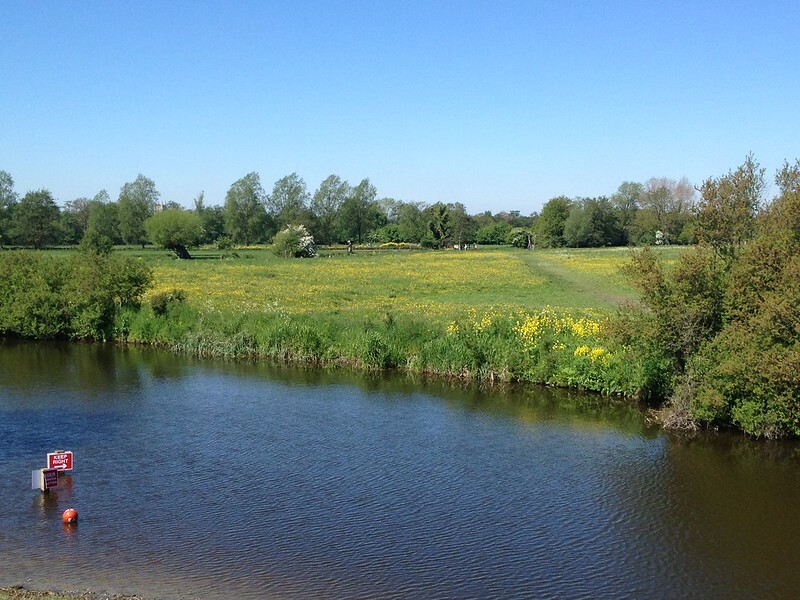 After visiting Flatford Mill, the area where Constable painted several of his most famous works, we walked back along the Suffolk side of the river. This path led past some very fluffy sheep and up on to a hill overlooking the valley. The hill was full of yellow flowers and dandelions. I’ve got some nice footage of the day which I will put up eventually. 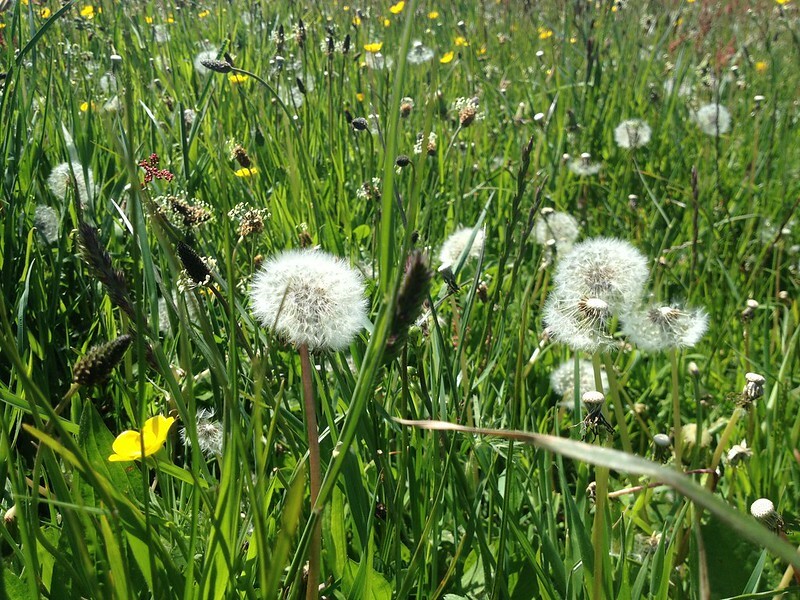 Exceedingly green fields full of flowers and dandelions – one of England’s best features! « Totally Self Indulgent Food Post. Gorgeous! Reminds me of where A and I stayed with his relatives in rural Cambridgeshire all those years ago. It feels like a different lifetime now! I have always felt that the UK is the most beautiful place in the world – which is not to say there aren’t awful bits as well but the scenery is so diverse. So much of it looks like it’s from a fairytale or a children’s book. Very much agree! When I’m here and it’s good weather I just want to be outdoors somewhere, because there are so many beautiful places to explore only a stone’s throw away. Beautiful photos, what a quaint little part of the world 🙂 Michael is currently looking into a Malaysia trip for us, KL, Melacca, Cameron Highlands, Penang and Langkawi, sounds good to me – I’ll go anywhere!! Ha ha yes well Facebook posts and emails are about as sophisticated as I’ve gone so far, Michael did a blog when he went to South America with a mate, he said it was pretty easy, might give it a go – though won’t have your masterful presentation and vids!! !